Helion Nutraceuticals recommends (for adults): 1 to 2 softgels daily, in divided doses. Maintenance: 1 softgel, 2 times a day. Cardiovascular Health: Studies suggest that Omega-3 fatty acids promote healthy lipid and triglyceride metabolism, blood flow, vascular dilation and tone, platelet function, endothelial function, and erythrocyte membrane composition. Research also suggests the potential for fish oil to contribute to healthy homocysteine metabolism. Joint Function: Omega-3 fatty acids act in part by maintaining healthy prostaglandin, cytokine and leukotriene production, supporting connective tissue and cartilage integrity. The results of numerous small double blind trials indicate that the omega-3 fatty acids in fish oil promote joint motility and joint comfort. Emotional Health: Omega-3 fatty acids are important components of neuronal cell membranes and are essential to cognitive function. By supporting vascular health, fish oils promote oxygen and nutrient delivery to the brain. Studies suggest that healthy red blood cell membrane omega-3 fatty acid concentration is associated with emotional well-being. Both epidemiological and double blind placebo-controlled trials indicate that Omega-3 fatty acids supports positive mood. Cognitive/Visual Development: Omega-3 fatty acids promote healthy mental function and maturation of the central nervous system, including support for cell health and neurotransmission. Essential fatty acids are also vital constituents of the retina, helping to support healthy visual function. EPA and DHA consumption by breast fed infants and children born to mothers who supplement with fish oils has demonstrated support for visual acuity and cognitive development. A longitudinal study suggests that infants born to mothers with higher DHA status demonstrated healthy cognitive capacity at 12 and 18 months. A randomized double blind study suggested that 4 year olds born to mothers who had taken fish oil had healthy cognitive function. Another study suggested that fish oil supplementation may enhance healthy night vision in children. Several studies have also revealed a relationship between dietary omega-3 fatty acids, healthy brain function and sleep patterns. Gastrointestinal Health: Omega-3 fatty acid supplementation has been associated with a soothing effect for the gastrointestinal (GI) tract. In a double blind, placebo-controlled crossover trial, subjects experienced positive support for GI comfort. A separate 6 month trial revealed that fish oil supplementation maintained healthy leukotriene production and immune cell activity in the colon. Skin Health: Omega-3 fatty acids promote vascular health, supporting oxygen and nutrient delivery to the skin. Studies have shown that omega-3 fatty acids protect keratinocytes and fibroblasts from free radicals and immune mediators generated by sun exposure, helping to soothe the skin. Additionally, they help promote elasticity and hydration for smoother looking skin. EPA and DHA promote cardiovascular health by supporting healthy triglyceride and lipid metabolism, maintaining healthy blood flow, and supporting healthy platelet function. Omega-3 fish oils of EPA and DHA are also important for optimal joint function. 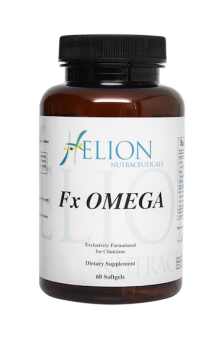 It maintains healthy prostaglandin and leukotriene production, which is important for maintaining connective tissue health and comfort.Furthermore, omega-3 fatty acids are important components of neuronal cell membranes and are essential to cognitive function.FxOmega has been carefully developed to provide ultra-purified and concentrated doses of EPA and DHA in minimal doses. Individuals can benefit from the convenience and safety of easy to swallow soft gels. 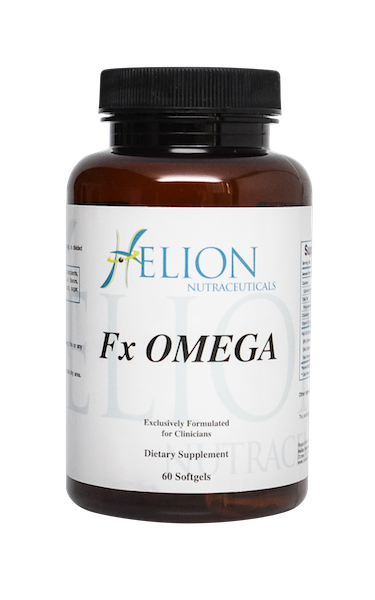 The FxOmega fish oils derived from anchovy and sardine are purified in a proprietary Advanced Molecular Distillation, gentle multi-step molecular distillation process that removes any possible heavy metals, PCBs or dioxins. Each lot of every product is tested by independent third party labs for: heavy metals (parts per billion), PCBs, dioxins, furans (parts per trillion), Oxidative byproducts & Microbial contamination. FxOmega meets or exceeds stringent guidelines, which include strict upper limits for PCBs, dioxins and heavy metals. In addition, each lot must meet California’s Proposition 65 for PCBs, dioxins and heavy metals. FxOmega tests well below the 0.09 mg/kg maximum level set for PCBs.